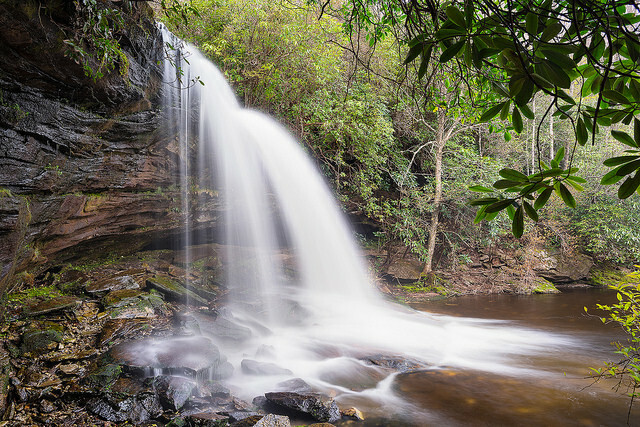 With North Carolina being home to over 250 waterfalls, its a little hard to pick just twenty, thirty, or even fifty, to explore. 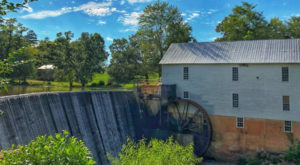 Despite the dreary weather currently overtaking my section of the state, making this list has me dreaming of the lush greenery of the North Carolina mountains. 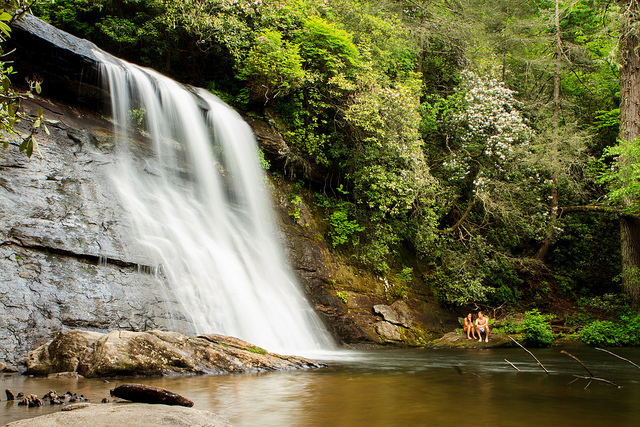 There is nothing quite like dipping your toes in that cool mountain water after a long summer hike on the Blue Ridge. I know there is warm weather on the horizon, so I’m making a must see starter list for springtime adventures. Literally speaking, take a hike! 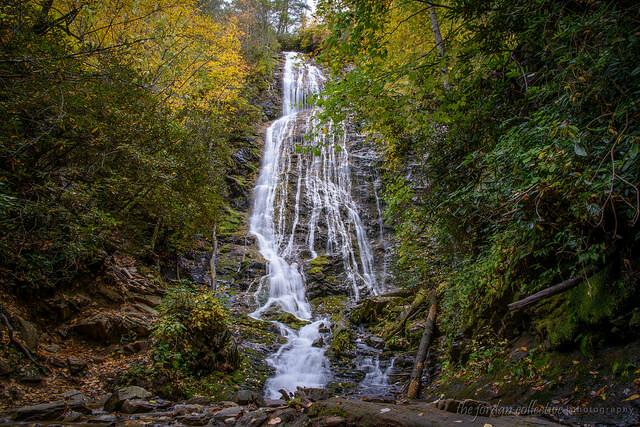 Here are 20 waterfalls in North Carolina that are waiting to be explored! Daredevils will take a jump off the cliffs into the water below. 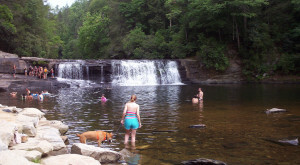 A small beach and easy entrance way into the falls makes this a great swimming hole. 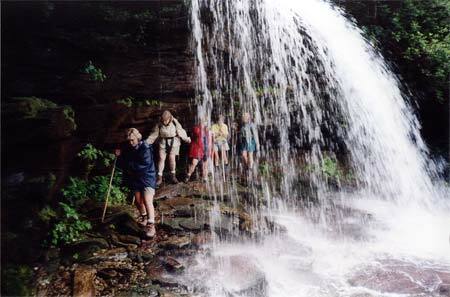 Somewhat hidden, Schoolhouse Falls is a great little gem to explore on a hike. With no clear signs, this one is easy to miss! 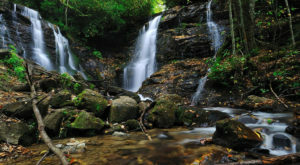 Near Maggie Valley and Cherokee, this twin waterfall is a quick hike from a parking area. There is an observation deck and you can also hike down to the falls and take some amazing pictures! 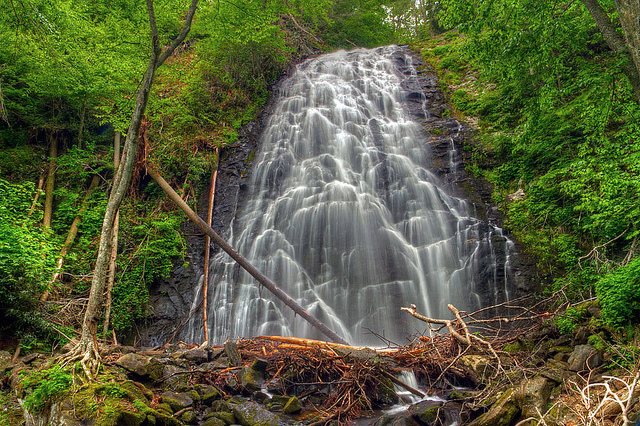 Hidden past the popular Looking Glass Falls, Moore Cove Falls is a secluded, and beautiful waterfall. A 1.5 mile hike takes you to Moore Cove. 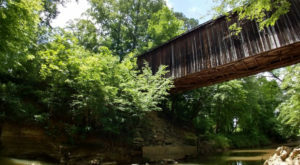 It is perfect for a picnic, and you can get behind the fall and take some great pictures! 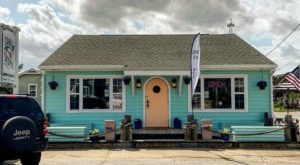 Located on private property, the owner is nice enough to share this little gem with others. 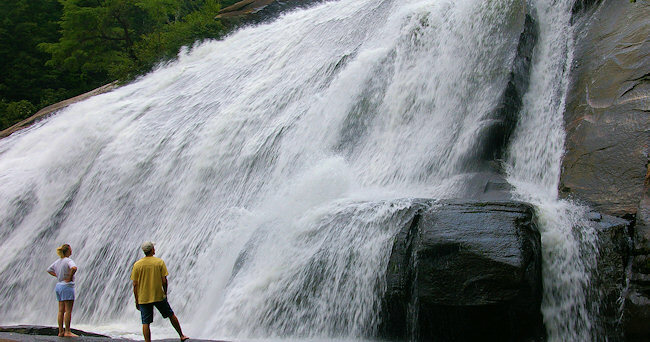 This 60-ft. cascade is easy to access with a short walk. 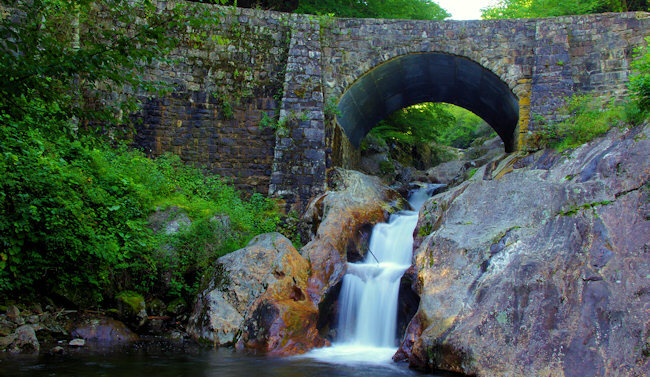 Nestled beneath a historic stone archway, Sunburst Falls is off of HWY 215 about four miles from the Blue Ridge Parkway. 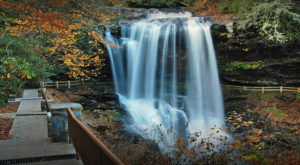 A more popular waterfall, Dry Falls got its name from the fact you can walk behind this impressive 75-ft. fall and stay...DRY! 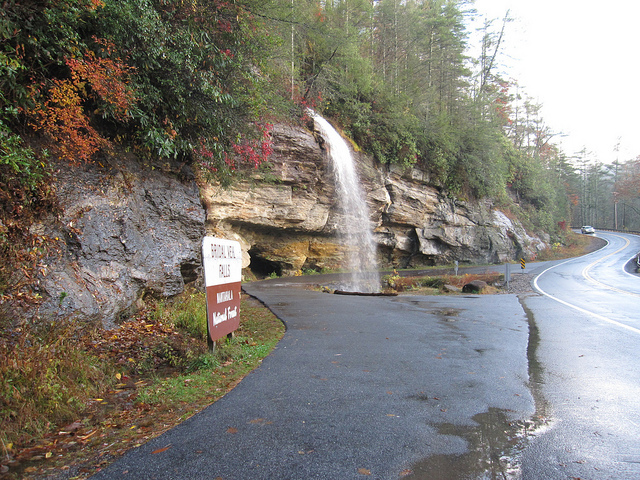 Speaking of staying dry, Bridal Veil Falls is the only waterfall in North Carolina you can DRIVE under! 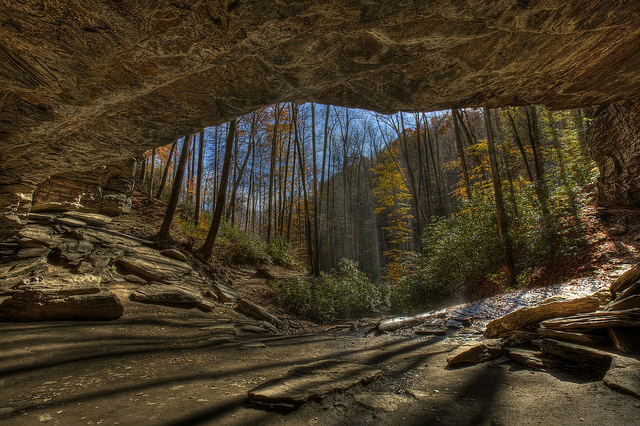 For an absolutely beautiful view, take a quick two mile loop near the popular Linville Falls to find your own little hideaway. 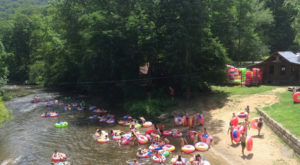 A popular pit stop for tubers, Tom Creek Falls is a great rest stop for opening a cold beer and enjoying the beautiful view. 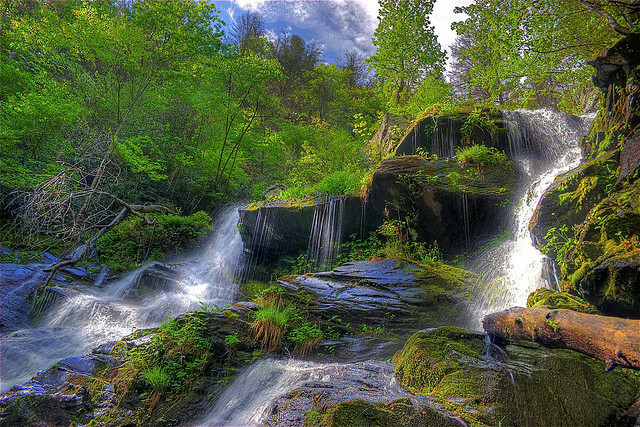 This 200-ft. waterfall is a sight to see! Nestled deep in the mountains, its a short hike up a staircase to access this breathtaking beauty. 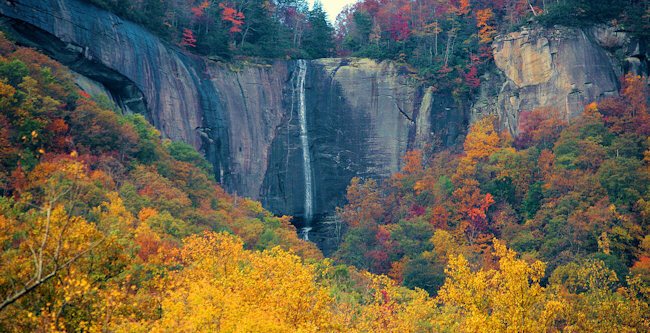 As one of the highest waterfalls east of the Mississippi, Hickory Nut was a filming location for The Last of the Mohicans. It is reached from an easy hike up a trail, and sources say, it is even more impressive after a good rain. 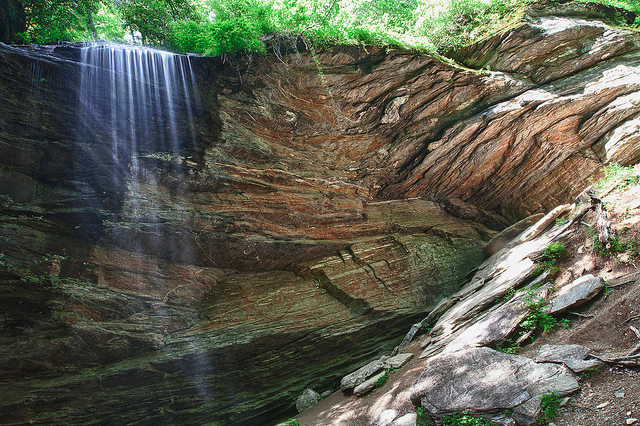 For those seeking a challenging hike with a rewarding end, Upper Falls is just for you! 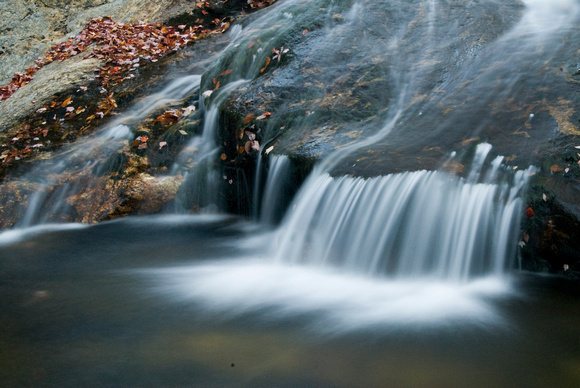 This gentle 25-foot fall cascades into a calm pool. 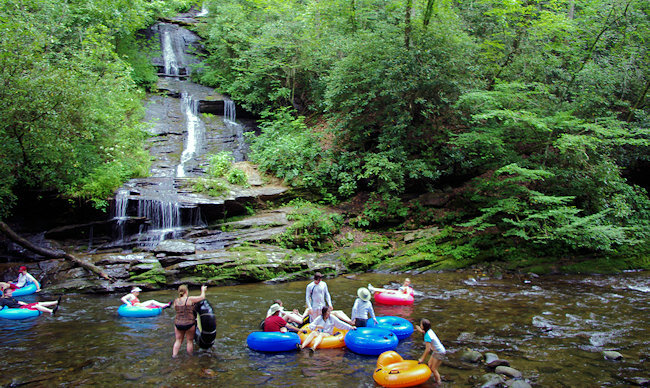 After a quick hike, relax and dip your toes in the cool mountain water. 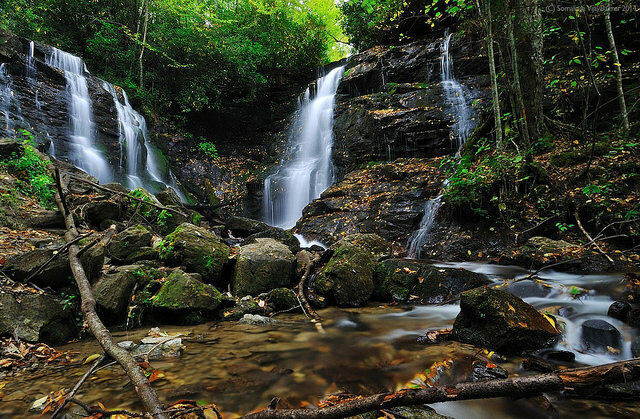 Right on the border of TN, Wildcat Falls meanders below an old logging road. Quite picturesque! 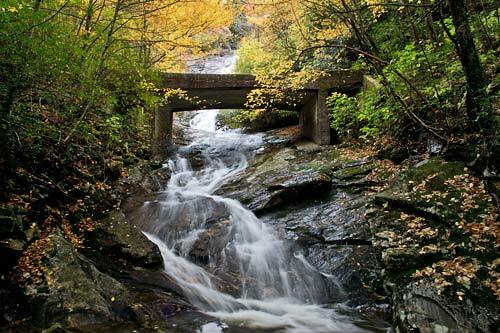 Located behind Living Water Ministry, this beautiful, quaint waterfall is accessed with an easy hike from HWY 215. 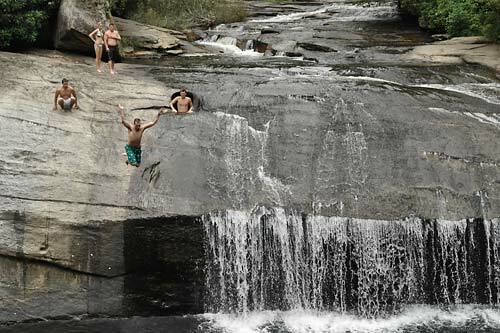 For a waterfall that instills adventure, this swimming hole is not for the weak. 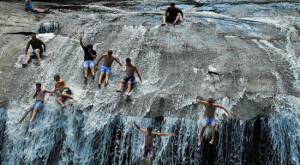 People slide down the 70-ft. rock, or, like pictured, just take the plunge and jump right in! I might, or might not, have put this one up because I absolutely adore the name. Either way, Bubbling Spring Branch Cascades is nestled between two larger falls, Wildcat, and Sunburst, off of The Blue Ridge Parkway. Hike a few miles and this really becomes a three-for-one type deal. High falls is very much a "look but don't touch" type of deal. 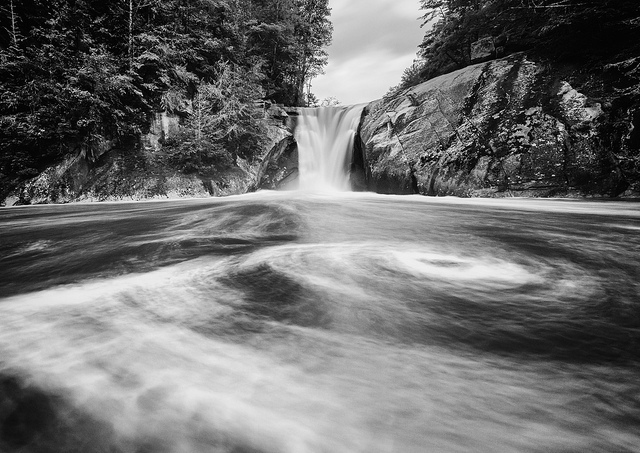 As one of the most powerful waterfalls in North Carolina, these roaring falls make for some ridiculously beautiful slow shutter pictures. I had to end this list with a waterfall the WHOLE family, including the grandparents and little ones, can enjoy. 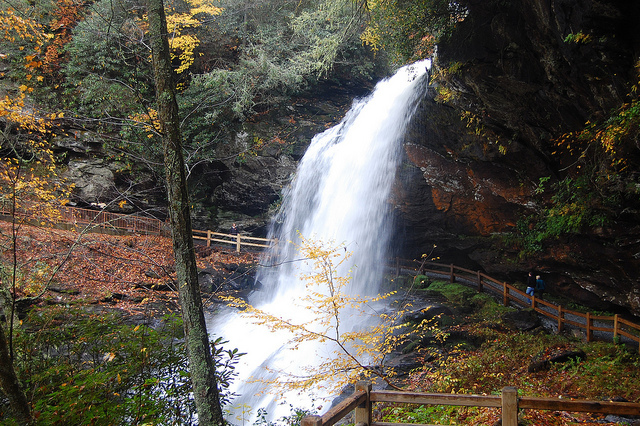 Looking Glass Falls is beautiful and easily accessed from roadside parking off of US 276. Which one are you planning to visit first? Or, have you experienced some of these gorgeous gems already? 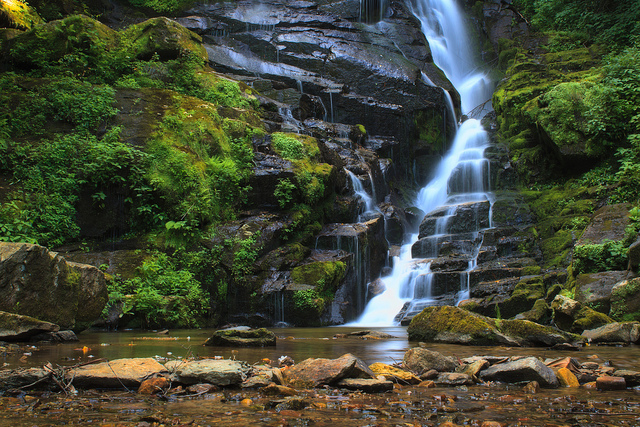 Share in the comments and make sure to include your favorite NC waterfalls!